With the 2011 season now at an end the teams are working even harder on their 2012 cars. We are also getting more clarity on driver line-ups, with F1 very much in tune with work practices in general – extending the retirement age with Kimi Raikkonen now returning to F1, this time with Lotus Renault, not sure if he’s having to make bigger pension contributions. But while much of the media attention focuses on 2012, the movers and shakers: the Team Principals and FOTA, the FIA, Formula One Management and CVC are all focused on 2013. This is when a new Concorde Agreement should come into effect. Recently in the FT, Leisure Industries Correspondent, Roger Blitz aligned the politics of F1 to those of the Eurozone, with an intense battle emerging between the haves (Bernie and CVC) and have-nots (FOTA and FIA) – my definition not Roger’s. The complex web that is the governance of F1 is yet again going to be stretched and rewoven, and currently, no-one is quite sure how this will all end up. Certainly we will see Bernie at his best – he always enjoys a good fight – and will undoubtedly be focusing on divide and rule with the teams, not a new strategy, but always an effective one, but who knows perhaps Martin Whitmarsh and his peers will be able to keep FOTA united and carve out a good result? The key is going to be where the FIA end up. In the past they have traditionally aligned against the teams, but perhaps this time we will see a new permutation? Expect plenty of off-track fireworks during 2012. However there are those in F1 for whom 2012 and 2013 matters not a jot: for the technical strategists in the teams work is well underway for the 2014 regulations which will require the cars to have 1.6 litre V6 power units and substantial Energy Recovery Systems (ERS) to harvest and reuse the energy to improve performance. The engine manufacturers are well underway with a variety of permutations and concepts and the teams will be keen to see how they can build the optimum package from this new powertrain. All in all the next few years are going to be a busy time for anyone involved in F1, regardless of whether or not the Eurozone holds together. Mark Webber secured an outstanding victory in Hungary yesterday, partly due to luck, partly due to some outstanding laps on the shorter life ‘option’ tyre, and also because, in his words, he went ‘off strategy’. One of the most important things about a strategic plan is knowing when to abandon it, and that’s exactly what Red Bull did when the Safety Car came out on lap on Lap 14. The accepted wisdom is to make your pitstop as soon as the safety car comes out thereby changing your tyres when the field is going relatively slowly, and so you lose less time. The problem for Red Bull is that this was fine for Vettel, who was leading, but would have meant that Webber would have remained behind Alonso in third place, and they wanted a 1-2. So they kept him out. This meant he was now in front with a clear track and had the task of building up a 20second lead over Alonso to move to second place when he made his pitstop. It worked perfectly, but was also helped (inadvertently I think!) 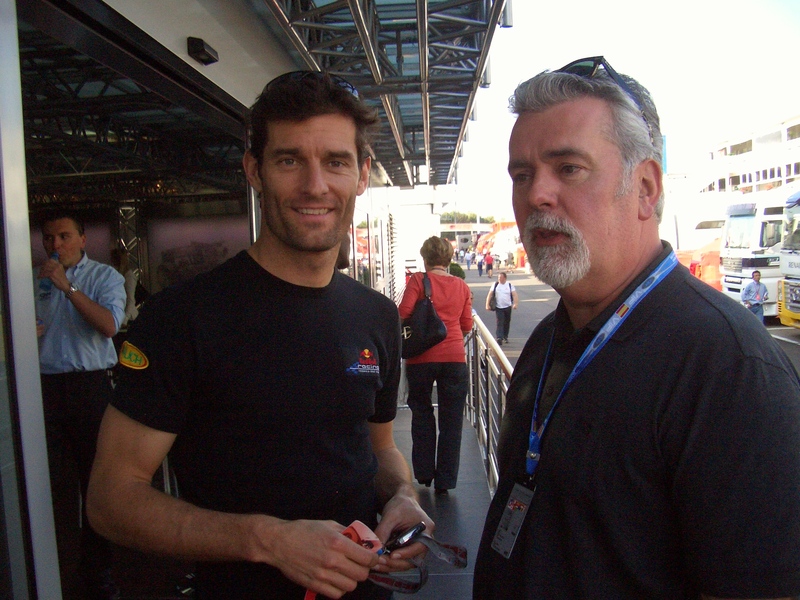 by his teammate Sebastian Vettel, who lost radio contact and became disorientated during the safety car period and allowed Webber to pull out a big gap between him and the rest of the field and so Webber disappeared into the distance when the safety car came in. Unfortunately for Vettel his tardiness in following Webber meant that he had exceeded the 10 car gap (does someone measure this?!) permitted by the regulations and so got a drive through penalty, which demoted him from a pretty certain win to third place. So Webber and Vettel swapped places, and it was nothing (as far as we know) to do with team orders. The other point of note from the race was just how close F1 is to a major disaster, despite all the work on safety. In the rush to get in and out of the pits when the safety car came in, Rosberg left with a disconnected rear right hand wheel, which promptly flew through the Sauber pit crew bounced some ten metres in the air and came to rest against a Williams mechanic, Nigel Hope, who fortunately was not badly injured. In the confusion that followed Robert Kubica was released from his pit box just as Adrian Sutil was trying to enter his and a collision occurred, mercifully with no injuries, but it could have been so much worse. Finally we had Michael’s ‘tough’ move on Rubens that was within centimetres of disaster, Rubens could have been intimidated and lifted off, but he didn’t and there was great joy in the Williams garage, it was only for a single point, but for Rubens making the move stick on Schumacher was worth a whole lot more.